Danielle received her 200-hour teacher certification from Yoga Bhoga with Meghan Maris and Scott Lennartz. A practitioner for over 15 years, Danielle currently teaches Hatha, HathaFlow, and Vinyasa yoga (here is some basic information). She incorporates yogic philosophy, pranayama (breath-work), and asana (postures) in each of her classes. 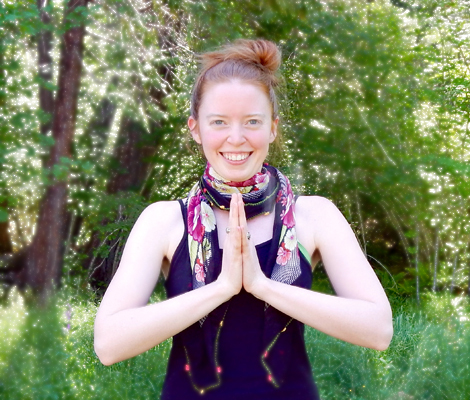 Her aim is facilitate positive, helpful experiences with correct alignment and deep breath, meeting students wherever they are at on their yogic path. I teach yoga to facilitate a time, space, and physical practice where people of all walks of life can come to know themselves on deeper levels. I teach yoga to encourage fullness of breath and gratitude for life. I teach yoga to connect with others on the path of discovery and conscious living. My journey with yoga began over 15 years ago. Having been a dancer since age 7, I developed an early familiarity with “stretching” and body awareness. However, during my first ever yoga class, in small room at a local fitness center in Upstate NY, I witnessed the deeper connection and transformation that yoga offers. My commitment to this transformation that comes from “yoga awareness” grew with me as I continued my studies in both dance and yoga throughout high-school and college. I noticed yoga helped with not only posture and strength for a healthy body, but also inspired a positive mental awareness and connection with soulful purpose that overflowed into many aspects of my life and knew this would be a life-long devotion. In teaching, I hope to spark this full-body awareness with others on their unique paths. Danielle also has a BFA in mixed-media and performance art from Alfred University and she continues to be inspired by many elements of her personal study yoga and of multiple dance forms, somatics, and zen meditation. She moved from New York to the Pacific NW in 2007.